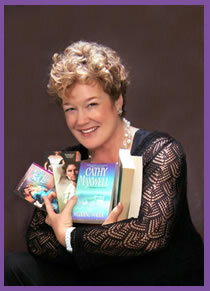 Cathy Maxwell returns today to answer some questions about the books she has coming out this year. Fans will be happy to know that there are reissued single titles, an anthology and a terrific new series on the schedule! Cathy, thanks for joining us and congratulations on the republication of WHEN DREAMS COME TRUE. First, when was WHEN DREAMS COME TRUE published? And why does a publisher “re-release” a book? WHEN DREAMS COME TRUE was first published in 1998, almost fifteen years ago. Publishers re-release because the public is interested in the author and want to read those classics. It’s a wonderful compliment. The novel is set in the Regency era—your specialty!—but it’s far from the ballrooms of London. Why did you choose a remote village and estate as a setting? Where is Cornwall, anyway? Cornwall is a peninsula located in the most western part of England. Eden would not be able to hide her past if she was in London, but here, surrounded by kind village people, she can be whomever she wishes. I also like the dynamic of country life. It truly is the heart and soul of England, even today. The village, Hobbles Moor, and Penhollow Hall are a world onto its own, with most of the story taking place there. What is it about stories set in this sort of microcosm that appeals so much to so many readers? Is it that it can be so entertaining to read about characters such as villagers, servants and the “local gentry” can be so entertaining to read—as well as a change of pace? Don’t we all love escaping to another world? Leaving the bills, the cares, the car pools? We all have our “villages” in real life. Our peeps. And I think recognizing them in literature is grand fun. There’s a bit of magic in WHEN DREAMS COME TRUE as the villagers cast a spell to bring the Earl of Penhollow a bride. Do you believe in magic? Is this something you’ve used as a plot device in other books? Which ones? I believe that when people come together for one shared purpose, great forces are set to work. Is that magic? Do we have the ability to will what we desire? Or is it Higher Power answering prayers? I’m open to everything. That being said, I’ll be using the mysteries of life again in my upcoming The Chattan Curse trilogy. The first book is LYON’S BRIDE and it will be released this May. Trained as a courtesan, the beautiful and innocent heroine, Eden, is destined to be part of a harem. Did her blend of knowledge and innocence make her a difficult character to write? Eden wasn’t any more difficult than the others. And perhaps easier. After all, she had a secret. She isn’t innocent . . . whereas Pierce was more complex. He is the character with a decision to make. Was including the harem a tip of the hat to the breakout romances of the late 70s from authors such as Johanna Lindsey, Rosemary Rogers and Kathleen Woodiwiss? I wasn’t thinking of them at all. Actually, I wanted to turn the tables. Eden is the one with “experience.” In many ways, Pierce is the innocent and I liked that thought of a “pure” knight. Which, if any, of your other novels is similar to WHEN DREAMS COME TRUE in terms of being set outside of London and the immediate concerns of the ton? Many of them—BECAUSE OF YOU, TEMPTATION OF A PROPER GOVERNESS, THE SEDUCTION OF AN ENGLISH LADY, IN THE HIGHLANDER’S BED, FALLING IN LOVE AGAIN . . . titled people for titled people’s sakes are not interesting to me. I like the dynamic of a society. It’s been fourteen years since Pierce and Eden got together. Surely one of their children will be old enough in a few years to have a romance of his or her own. Do you think you’ll ever return to Penhollow Hall? I don’t know about revisiting Penhollow Hall, although I suspect I’ll be returning to Cornwall again. For the research on this book, I read Daphne du Maurier’s Vanishing Cornwall. Cornwall was the setting for many of her books and her travelogue is wonderful reading for an armchair traveler. How can readers get in touch with you with questions and comments? And are you on Facebook? Yes, I’m on Facebook. Isn’t everyone? Readers can find me at http://www.facebook.com/pages/Cathy-Maxwell/166883240063709 if they want to yak at me. What have you got in store for us next? This is a Maxwell packed spring! The first of The Chattan Curse books is out in May, LYON’S BRIDE. Then, in June, Avon Impulse is releasing an e-anthology titled FOR LOVE AND HONOR. Lynne Hinton and Candis Terry are the book’s other two authors. We were each given the theme of “a soldier” and turned loose from there. I adore my contribution The Bookish Miss Nelson. It is set during the Peninsula Wars in the early 1800’s. Then, Pocket Books will be re-e-releasing (did you catch all of that?) a novella I wrote for them a decade ago titled, In a Moonlit Garden. It will be out in July. Long time fans will know this is from the TEA FOR TWO anthology I did with Liz Carlyle. Finally, the second book of The Chattan Curse trilogy, THE SCOTTISH WITCH, will be out in November of this year. The third book, THE DEVIL’S CURSE, should be out next spring. I have my nose to the grindstone! Thanks again, Cathy! Looks like it's going to be an exciting year! You have been one busy lady. I like books set in locales different from the norm. It adds to the story and changes the rules a bit for the characters. I love anthologies and FOR LOVE AND HONOR sounds like it will be a good one. I hope I have an e-reader by then. Congratulations on the rereleases. I know first hand how frustrating it is to try and find a book that was released a while ago and no longer in print. There are always readers who have just discovered you and want to read as many of your books as they can. Best of luck with the CHATTAN CURSE trilogy. The touch of magic will give the story a special flavor. Hi librarypat! I also enjoy occasional forays into different locales in the books I read. I love that so many previously published books are being re-released in digital form. I can stock up on old favorites and discover new ones without overflowing my bookshelves. (which are already overflowing!) lol! Congrats to Cathy on the new and re-release. I'm excited about the new trilogy. It all looks just wonderful. Good Morning all! I'm off to work early today so no time to play. :( I'll be back later in the day! We will be counting on you to return, PJ! Sounds like a lovely way to spend the weekend, Janga! I love your books, Cathy, and I am so glad that you keep churning them out! I especially want to grab a copy of WHEN DREAMS COME TRUE because I missed it on the first go-round. Wonderful news for Cathy Maxwell fans!! Reissues & lots of new books, too!! You made my day!! Wow, lots of good stuff coming this year. I'm looking forward to picking them up. Ready to dig into the new series! 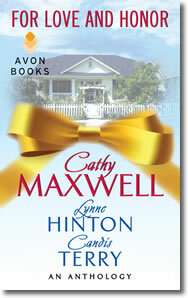 Love Cathy Maxwell books! And will be reading some of the reissues as well. The new series sounds great. I'm looking forward to it. Cathy, I love all of your books and I'm looking forward to reading your new ones. I was intrigued about the question of why small towns appeal to people. I know for myself I would so love to visit some of these small towns in Cornwell and other areas to see the architecture, the stores and just people watch. How wonderful that would be! Congratulations on all of your successes and best of everything in the future! Wouldn't that be fun, Connie? Sounds like a perfect vacation to me! Congratulations on the new series and reissue. I haven't read any of your books yet, so I will need to rectify that. The plot sounds intriguing in both books. I'm thrilled that your previous books that I missed are going to be re-released so I can fill in the ones I wasn't able to purchase at the time! Being a "small town girl" I love the stories that you write that are set in the villages of England. My husband and I had the pleasure of visiting England many years ago and found the people in the small towns and villages were welcoming and friendly and all to happy to point us in the right directions to unexplored delights in their area. We had enjoyed London but we found peace and pleasure in the smaller towns and cities and a real feeling for the people that we didn't find in London! "We had enjoyed London but we found peace and pleasure in the smaller towns and cities and a real feeling for the people that we didn't find in London!" What a lovely way to put it! Oh, Erin, you have some wonderful reading ahead! Hope you enjoy getting to know Cathy's characters! I don't know how it happened but I haven't read you as yet but all your books sound wonderful! One of my favorite historical authors, Catslady. Hope you enjoy discovering Cathy's books! Isn't that a great shot? Congrats for the re-release! I love the setting, i was getting bored with london setting in my historical reads. You sure are having a busy year!!! Enjoy!!! Wow, how awesome for all of us lucky readers! More Cathy Maxwell books!! Big congrats on your new and re-released books, major yay you! I have been reading your books since I first picked up A SCANDALOUS MARRIAGE, a wonderful book. I found out it was a connected book so off I went to find books #1 and #3, lucky, lucky me! Since then, I make sure I get my hands on any books written by you. For those of you who haven't read any of Cathy's books, please, rush out and get them, you will NOT be disappointed! I have LYON'S BRIDE, the first in The Chattan Curse Series. It's at the top of my TBR pile, I can't wait to dive in. Wishing you the best Cathy! P.S.S. ~ I have to agree with Gannon "new picture is fabulous---you look maaahvelous, darling!" Congratulations on the republication. The book sounds good. Thanks for all the encouragement, everyone! I'm in Kansas City right and enjoying a rainy day. Hi Cathy! I live here in KC, and am so excited to hear that you are/were here. Did you have a book signing, or just visiting? Congrats on your new books and your re-releases! I want to read them all. Hi, Cathy--I was in KC for family but I'm returning this Saturday to speak at the Olathe Public Library. Then, I'll be in Topeka on Monday before heading to Ohio. If you get a chance to stop by the library, introduce yourself.